LOUISE CAMPBELL ON THE DESIGN "A candlestick that is everything but streamlined. As the saying goes: the more elements you join together, the merrier the result. Can be constructed in infinite ways. The design is a blend of the formal and the informal. 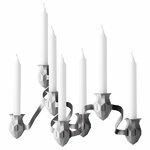 Crystalinspired candleholders are made of the softest matt rubber; the garland-like arms are pressed in hardwearing steel and then coated. Assembly can be conducted with a sense of meticulous symmetry, or with complete chaos, as you wish. Using 4, 7, 14, 27, 77, 189… elements, according to desire." Louise Campbell (b. 1970) is a Danish designer who graduated from the London College of Furniture in 1992 and later on continued her studies in Industrial Design at the Danish Design School, graduating from there in 1995. Being the daughter of a Danish father and an English mother, she grew up and was educated in both countries and her dual nationality has certainly had an influence on her works. Her interest as a designer is focused on furniture and lighting design, but is increasingly involved in product design and interior design projects as well. The client list is long and varied, including companies such as Louis Poulsen, Zanotta, HAY, Royal Copenhagen, Holmegaard, Stelton, Muuto, Interstop and The Danish Ministry of Culture. Louise Campbell's designs are playful and experimental, and are increasingly gaining a reputation for gently twisting not only every day objects and situations, but also materials and manufacturing processes in new directions. Louise Campbell’s most famous works include the Prince chair for Hay, the Collage pendant lamp designed for Louis Poulsen and the More the Merrier candlestick created for Muuto. The Prince chair was originally designed in 2001 for a competition setting the task of designing a chair for His Royal Highness the Crown Prince Frederik of Denmark. Bound by centuries of firm traditions, and yet a young man very much in touch with his generation, Frederik lives a life full of contrasts. These contrasts were the obvious inspiration in designing the chair. On one level it illustrates a motif resembling fine old lace, (there is a point to the transparency of the chair – it is hard for a prince to hide from the public eye,) on the other level the chair is produced using visibly high technology methods. By challenging modern manufacturing processes, it is possible to perforate two very different materials – steel and rubber - with precisely the same pattern. The steel creates the framework of this chair, the rubber gives it softness and comfort, a refreshing alternative to upholstery. The chair didn’t win the competition, but has, since Hay decided to put it into production in 2005, managed to create a pleasantly high-flying jet-set life for itself anyway: it has won several awards and is now part of the MoMA collection in New York. The elegant Collage pendant lamp designed for Louis Poulsen was inspired by the way light in a forest filters through thousands of layers before reaching the ground. The pattern is based on a simple abstraction of the ellipse, which is positioned seemingly freely on all three layers. From nowhere does the light source blind the eye in spite of the hundreds of holes in the pendant. The More the Merrier, designed by Louise Campbell for Muuto, is a candlestick that is everything but streamlined. As the saying goes, the more elements you join together, the merrier the result. The candlestick can be constructed in infinite ways – ranging from a meticulous symmetry to a complete chaos. The design is a blend of the formal and the informal. Louise Campbell has received several awards including the Prince Eugene Medal and in 2005 she was nominated Danish Designer of the Year.